... All things are one thing and that one thing is all things—plankton, a shimmering phosphorescence on the sea and the spinning planets and the expanding universe, all bound together by the elastic string of time. It is advisable to look from the tide pool to the stars and then back to the tidepool again. Winter brings spectacular daytime low tides to the Malibu coast, offering earthbound mortals a glimpse of the bizarre and wonderful microcosm that exist between the ocean and the shore. This year, some of the lowest tides of the year will arrive just in time for Christmas. This "king tide" occurs during the new moon and peaks from December 21-23, but there will be low tides in the afternoon all week, starting on Wednesday, December 17, with a .65-foot low tide at 12:45 p.m. The lowest tide—minus 1.24—will arrive on December 23 at 4:30 p.m. It can be hard to make time for anything extra—even mundane necessities like laundry—during the holidays, but an hour at the beach is a wonderful thing for restoring equilibrium. Park visitors explore the rocky landscape revealed during a minus tide in November. December's new moon low tides should be even more revealing. This was a minus .44 tide. On December 23, the tide will be minus 1.24. Visitors, and even locals, often fall into the comfortable pattern of picking a beach and sticking with it. The winter low tides are an invitation to step out of that habit and explore. Leo Carrillo, El Matador, Point Dume and Surfrider all offer good opportunities for tidepooling. These are all State Park beaches, and while there are parking fees for the official lots there's always plenty of free parking near by on PCH or, in the case of Point Dume, along Westward Beach Road, where a half-mile walk along Westward Beach and up and over the Point Dume Headlands to reach the access stairs down to Pirate's Cove provides an opportunity to watch for dolphins and the first winter whales. The most accessible tidepools in the Malibu area are at Leo Carrillo, where the intertidal zone starts just a few hundred feet from PCH. They are also some of the best. Despite its proximity to the road, this area is still home to an amazing array of marine life. 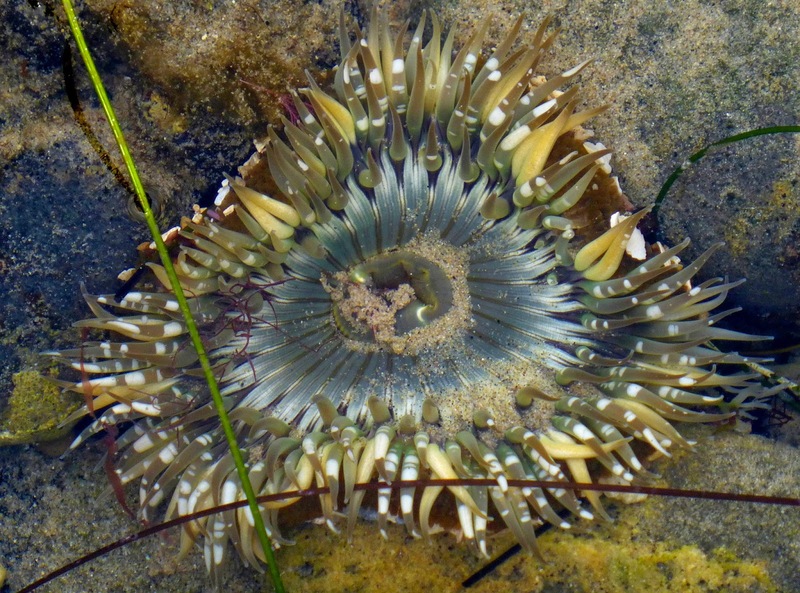 The starburst anemone at the top of the page is open, active, and waiting for prey to come its way. 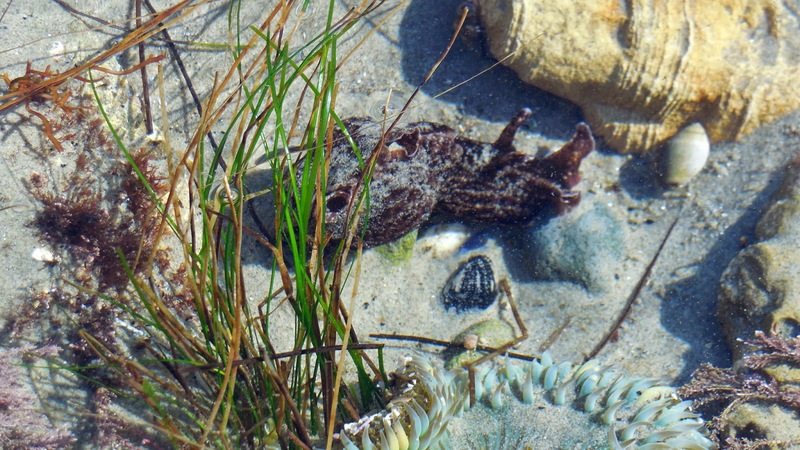 This one is exposed during the low tide. It's pulled its tentacles in while it waits for the water to rise again and is attempting to avoid becoming prey itself with a camouflage of broken shells and urchin spines that it glues to its outer layer with a tough, waterproof cement. The California sea hare, Aplysia californica, can move fairly rapidly in the water, where it grazes on algae, but it's entirely helpless out of the water. 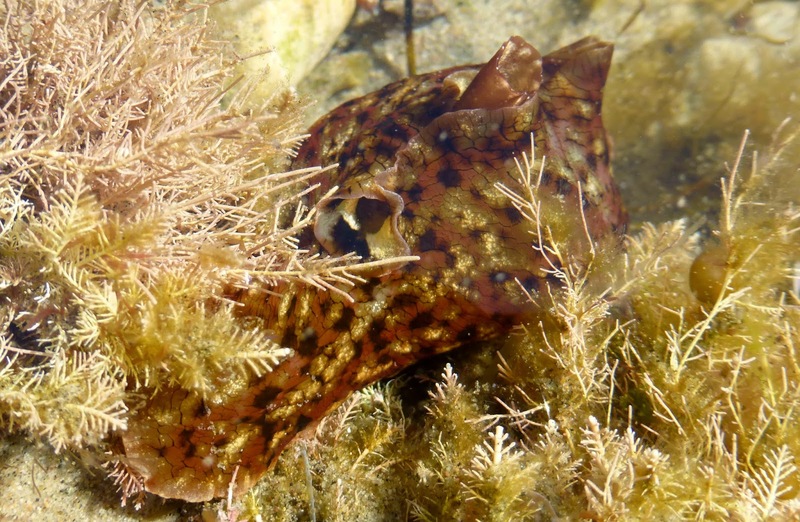 Just like the anemone, the sea hare has a strategy to wait out the low tide. Like its distant garden slug relatives, this sea slug conserves moisture behind its thick, slimy skin. It can survive for several hours this way, even in full sun, until the tide returns. This sea hare is just a couple of inches long. If it survives, it can grow to be 16 inches long and weigh up to five pounds. 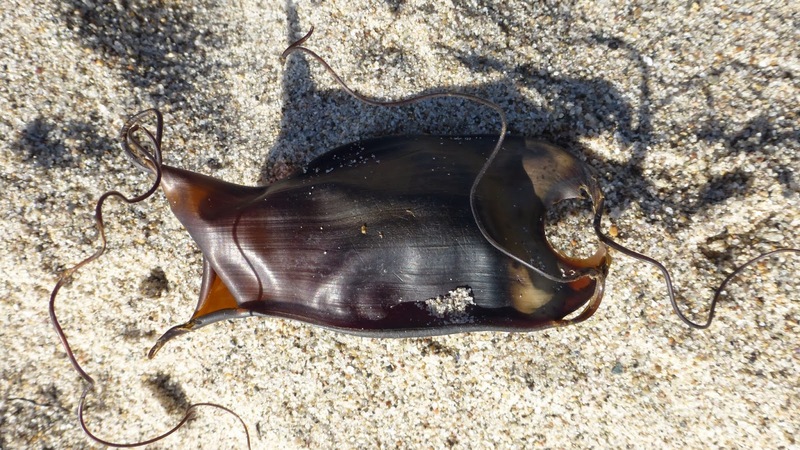 Most encounters with the sea hare are on the shore, where this unfortunate animal, unable to move and armed only with purple ink to discourage predators, resembles a black blob. In the tidepool, they're actually rather spectacular, with a pattern of gold and red spots, and a graceful undulating motion when they swim. 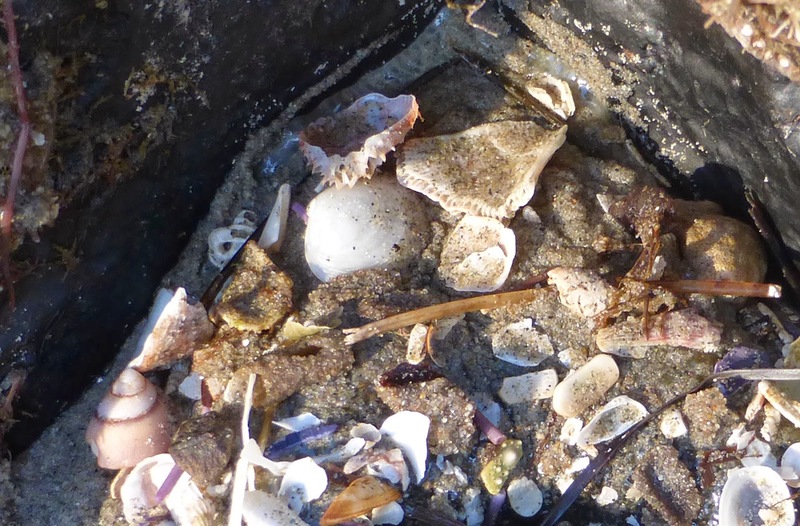 Empty California cone shells often wash up on the beach, or turn up in tidepools as the home of hermit crabs, but it's rare to get a glimpse of the live mollusk. 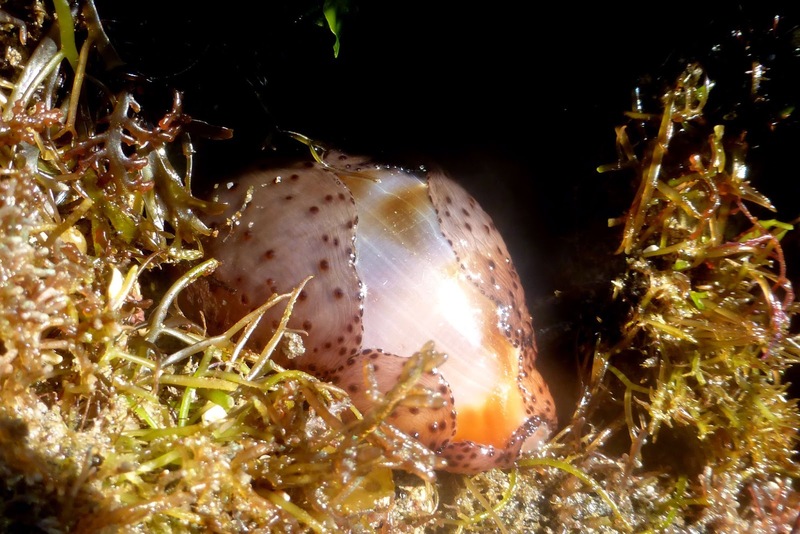 This small sea snail is a veracious predator that feeds on a wide range of species, including purple olive shells and, believe it or not, fish, which the snail paralyses with a fast-acting venom. There are a number of tropical species of cone shell that are deadly to humans. 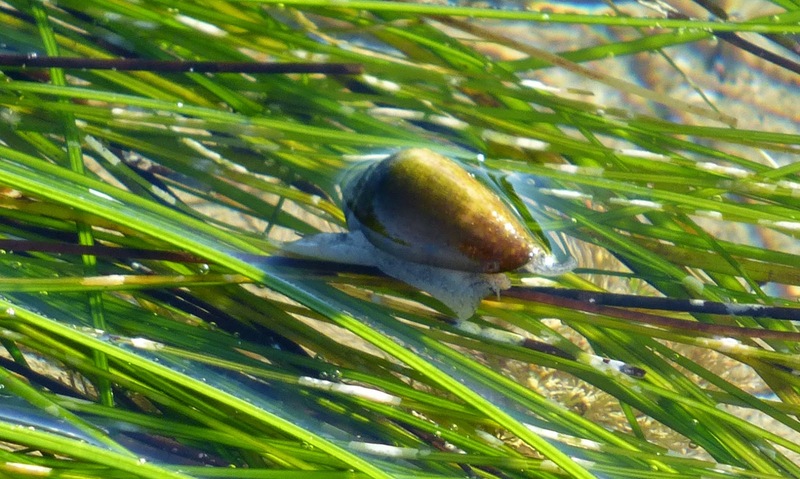 This little snail is only a threat to other snails, worms, and tiny fish. However, cone venom shows promise as a pain medication for humans. The tidepool sculpin, Oligocottus maculosus, is one of the species the cone shell preys on. In fact, it's one of the species all kinds of things prey on, which is why it, too, has a weapon: sharp spines on its fins. 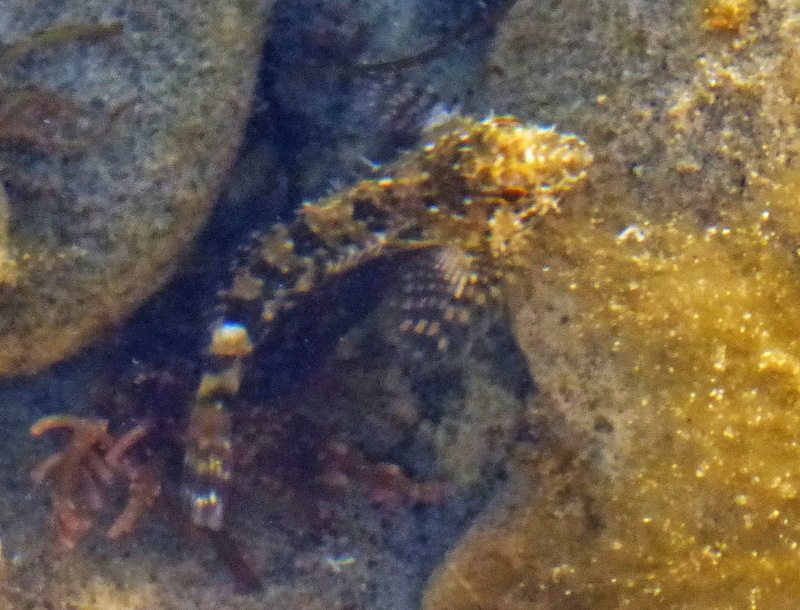 Some sculpin are also equipped with venom but I've never heard of anyone getting stung by a tidepool sculpin. It may look fierce and somewhat dragon-like, but it seems to depend on being fast moving and hard to see for survival. This remarkable small fish can breath air if it finds itself trapped out of water or in a pool with low oxygen levels during low tide. It's the most commonly observed fish in our local intertidal zone. Here's someone who isn't impressed by cone shells, except as a source for housing material. 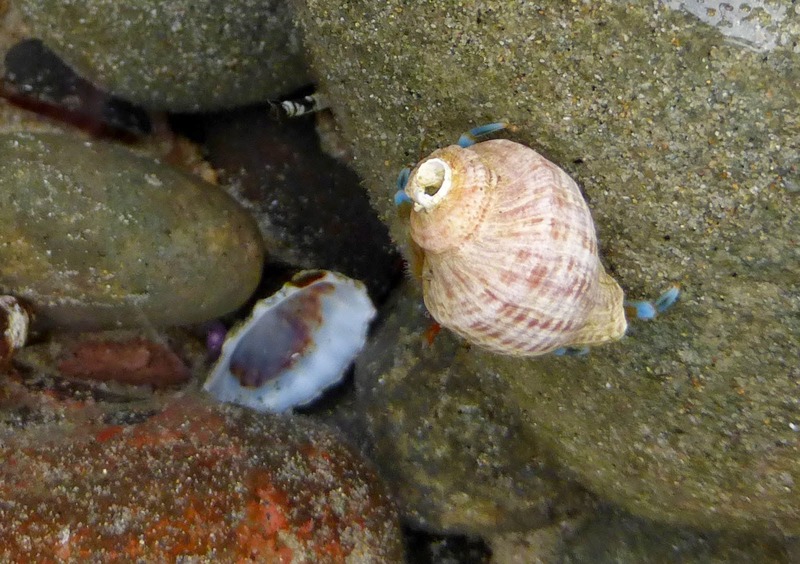 This is the blue-band hermit crab, Pagurus samuelis. This one has taken up residence in a somewhat battered Acanthina shell. Blue-bands are one of the most common Southern California intertidal hermit crabs, and always fun to watch—they're fast moving and usually very active. If you are fortunate, you might see one of these. This is a live California cowrie, also known as a chestnut cowrie or Neobernaya spadicea. Although it's hard to see here, this mollusk has, arguably, one of the most beautiful shells found in Southern California waters, and it has been collected to the brink of disappearing along the local coast, although their numbers appear to be increasing recently. I've seen more chestnut cowries at Point Dume this year than I have in the past 10 years. I don't know what that means, but hopefully it's good news. 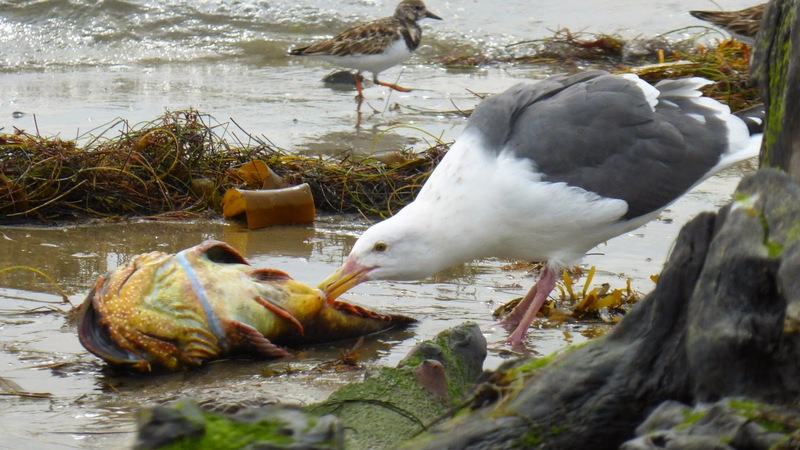 Humans aren't the only ones taking advantage of the winter minus tides. 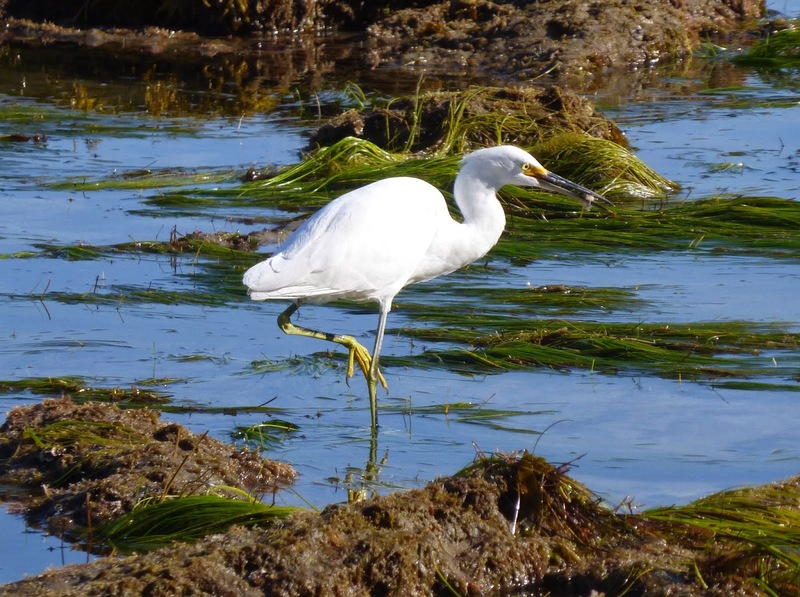 This great egret has just snagged a fish—probably a sculpin—in a bed of surf grass and is in the process of turning it right-way-round to swallow it. The shorebirds also take advantage of the low tide. 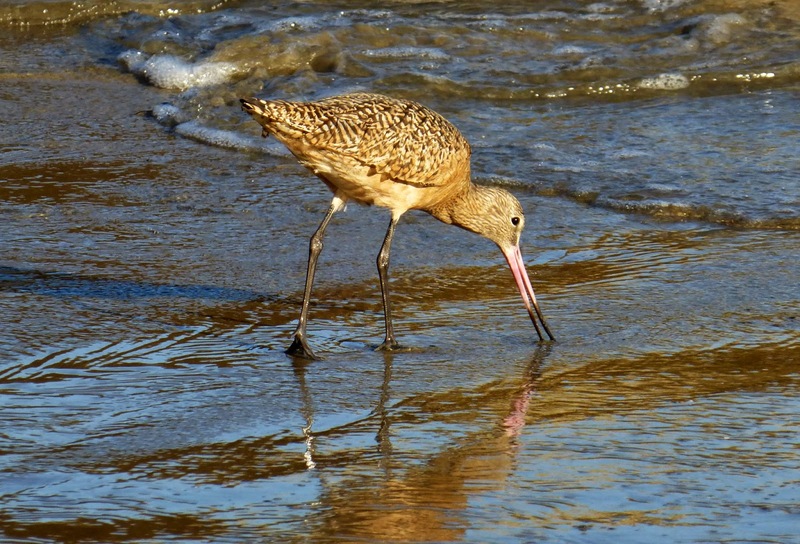 Godwits have specialized bills that have evolved to enable them to probe the sand for sandcrabs and other tasty morsels. This bird is sometimes mistaken for the curlew, another shore species with a long bill. An old birdwatcher told me long ago that the way to tell the difference is to remember that the curlew's beak curves down, while the godwit's beak curves slightly upward—towards God. I am extraordinarily blessed to have had the opportunity to grow up by the ocean and to still spend many hours there. I've seen many tides—high and low—but I still see things that amaze and astonish me. The curious object in the photo above is called a mermaid's purse. It's actually the egg case of a dogfish shark or a stingray. I've read about them all my life, but this is the first one I've ever seen. I found it among the tide wrack at Surfrider Beach last week. The Christmas season brings many gifts, literal and figurative, but sometimes one of the best gifts is finding the time to step away from everything. There's no reason why a day at the beach, or even just an hour, shouldn't be part of holiday tradition. The king tide offers a perfect incentive. However, there's another chance to catch a spectacularly low afternoon minus tide during the first king tide of the new year, the week of January 20, 2015. It's important to remember that the reverse side of this week's minus tides are formidable 8-foot-plus high king tides. Beachgoers should double-check the local tide tables and plan to leave when the tide begins to come in. 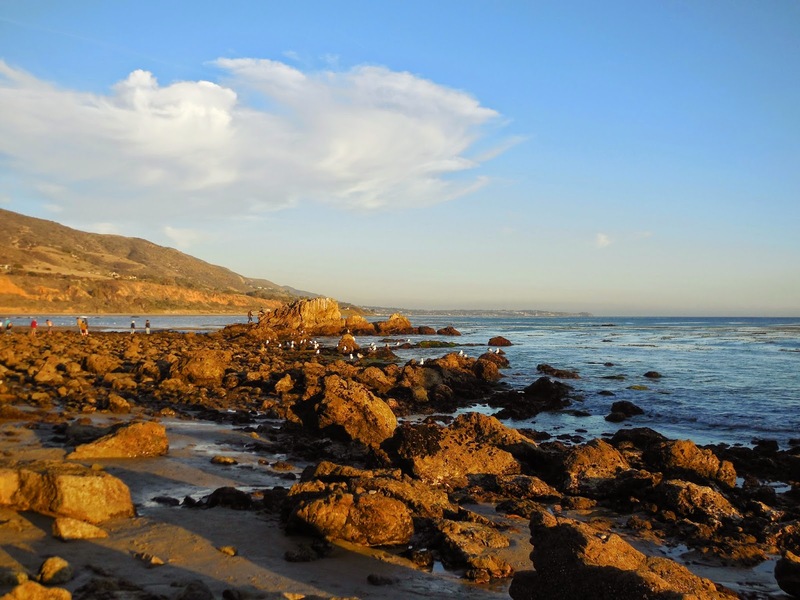 This is especially critical at beaches like Leo Carrillo, El Matador, and Point Dume, where the low tides provide access to sea caves or otherwise inaccessible rock formations that are rapidly reclaimed by the returning tide and can trap unwary visitors. That sounds preposterously melodramatic, but serious injuries—and the need for rescue—result more often than one would think. It's a good idea to keep an eye on the surf report as well as the tide chart. Waves like this one at Point Dume on Sunday are great for surfers but less than ideal for tidepool explorers. Winter storms bring joy to the surf community but they can complicate the tidepooling experience, generating big surf and "sneaker" waves even when the tide is at its lowest. The warnings about staying off piers and breakwaters during high surf events also applies to reefs and rocks, and it's good to remember that old advice about never turning your back on the waves. The website for NOAA tide predictions offers an easy to access, accurate online source for tides. Surfline is a good basic surf report site. This is their page for Point Dume. There are also dozens of tide and surf report apps. Looking for the perfect Christmas gift? A selection of cards and photographic prints from the Malibu Post is now available at Fine Art America. This website has tide charts for almost every area around the world.